While rummaging through the mess otherwise known as my desk, I found my current Entertainment book. Heck, I think I've only used 3 coupons so far! With precious months already gone, I decided it was time to use those pesky "not really interesting" deals. 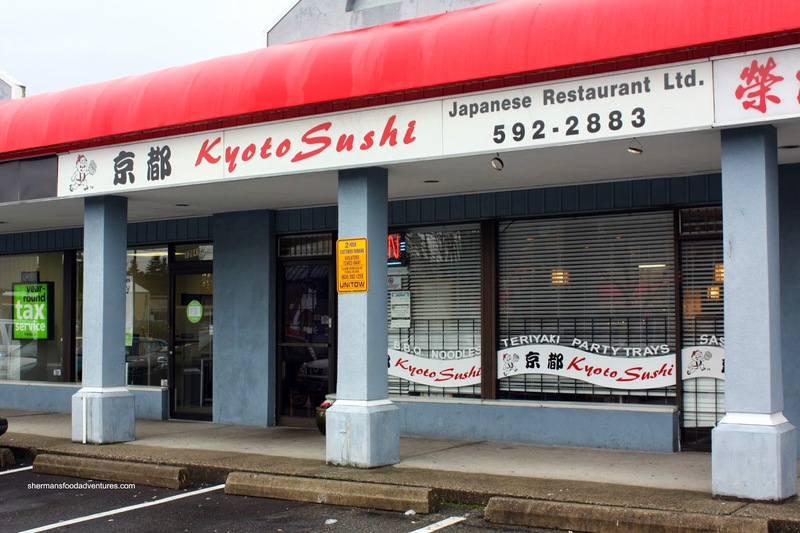 So it was as good as any time to do a revisit to Kyoto Sushi, which was at one time was known as the "best sushi restaurant" in Surrey according to the Now. Um... and why was Tokachi left out of this discussion? Depends on the voters right? Another reason I decided on Japanese was that Bunny insisted on it. Do bunnies eat raw fish??? Apparently this one did because we did order some. But to start, there was the usual Miso Soup and Sunomono Salad (as part of the bento). 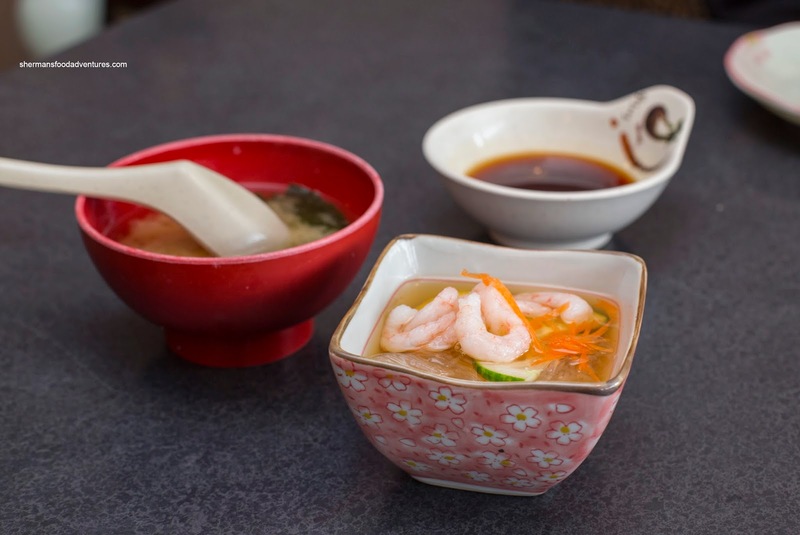 Nothing much to say about the miso other than it wasn't overly salty. As for the sunomono, it was too sweet and the noodles were gummy and lacking texture. The small ebi had a nice meaty texture though. 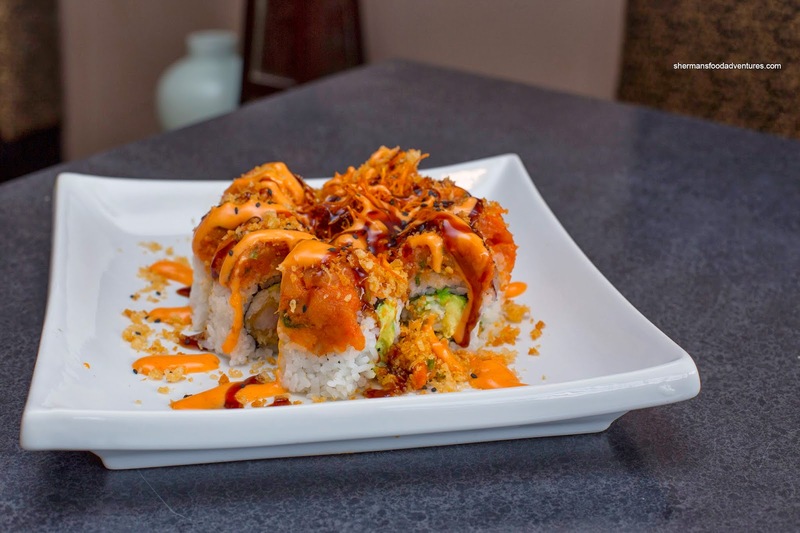 We ended up with the Volcano Roll consisting of ebi tempura, cucumber and avocado with spicy tuna, spicy mayo, unagi sauce and fried yam straws on the outside. The roll itself was okay, but there was a tad too much rice and the sauces were a bit much. Hence, the saltiness hid the other flavours. Arriving as an impressively large portion, the Ika Karaage look more like Indian Pakora. 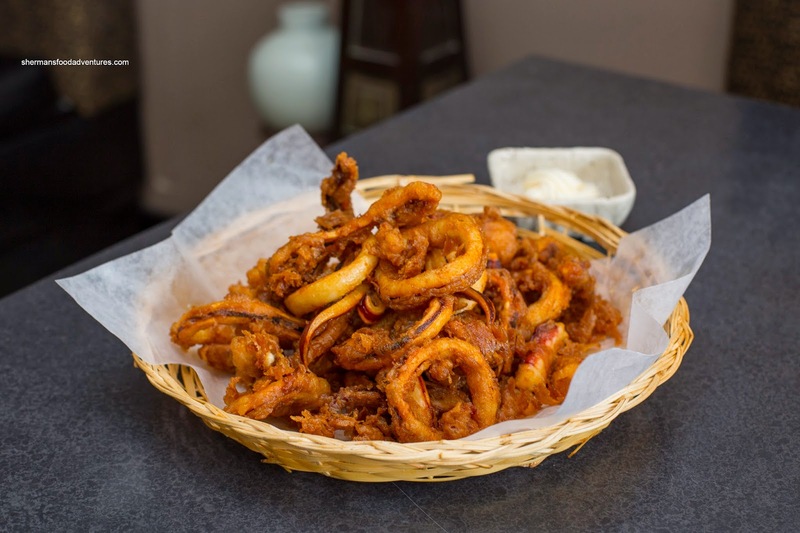 With a mix of fully battered pieces and some that lost most of its coating, the squid was somewhat chewy. With that being said, it wasn't tough though. There was enough seasoning where we didn't really need to use the side of mayo. 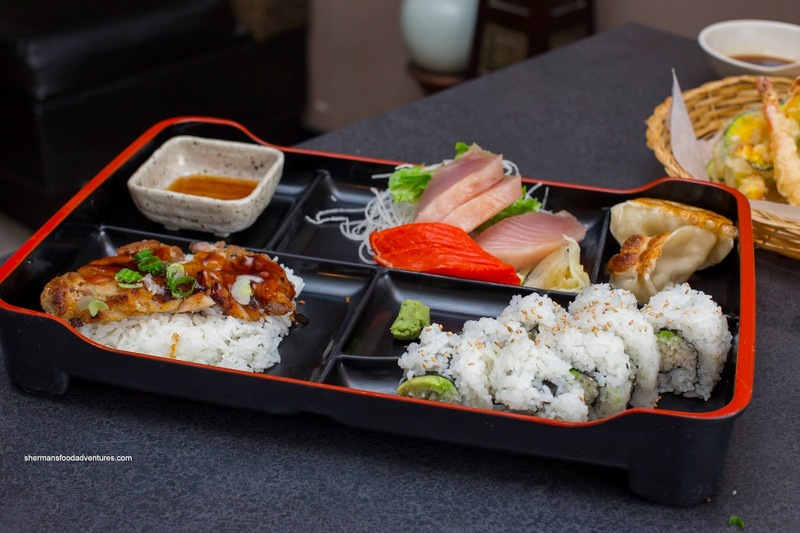 To get a variety of items, we got the aforementioned Bento E consisting of Chicken Teriyaki, Tuna and Sockeye Sashimi, Gyoza and California Roll. We found the chicken to be too thin and dry, yet not over-sauced. While the tuna was decent, the salmon sashimi was terrible. It was rubbery and dried out on the outside, indicating it had been sitting around for awhile. Although fried up nicely, the gyoza was too dense inside and out. Completely butchered, the California Roll was ugly and the rice was dry and flavourless. 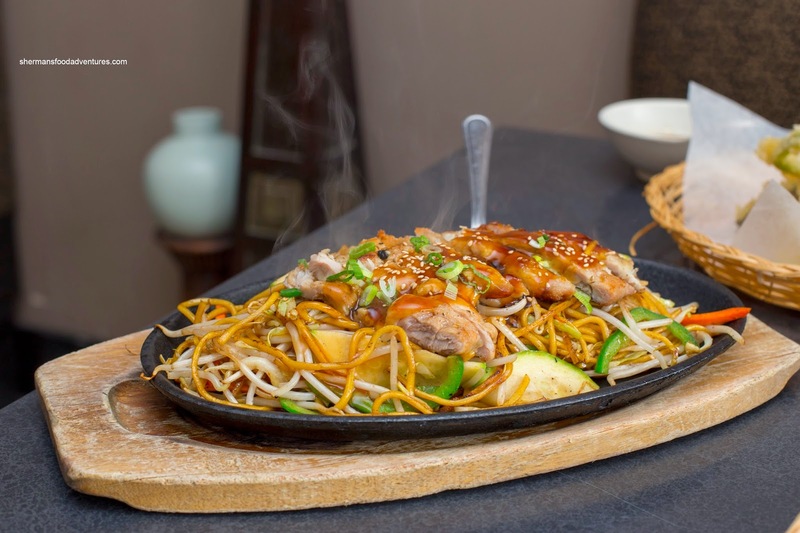 If that wasn't enough food, we had the sizzling hot Chicken Yakisoba. Now this was a decent dish. The noodles to veggie ratio was just right while there wasn't an excess amount of moisture. Hence, the noodles were chewy and the veggies were crunchy. The caramelization from the hot iron plate ensured depth of flavour. Unlike the teriyaki chicken, the chicken atop the noodles was moist. 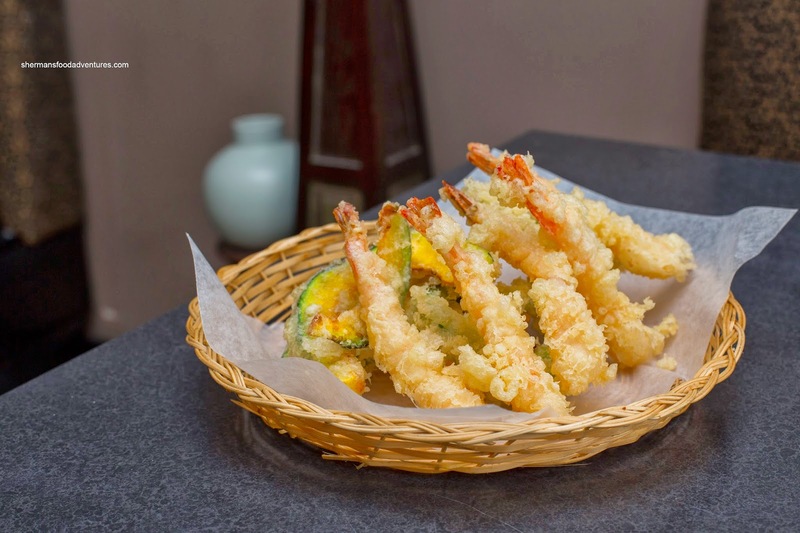 Lastly, we had the Prawn and Veggie Tempura. The batter was crunchy and not overly greasy. With a buttery snap, the prawns were good while the veggies were just cooked. Overall, this was a hit and miss meal. When there was a hit, it was pretty good, but when there was a miss, it wasn't even close. Hence, it is essentially a crap shoot as to what your experience will be like.